Bring your documents and presentations to life. Easy to clean, use, and install. 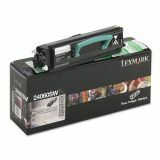 Lexmark 24060SW Toner, 2500 Page-Yield, Black - Return Program Toner Cartridge is designed for use in Lexmark E232, E232t, E330, E332n and E332tn. Yields 2,500 pages. Lexmark Return Program Cartridges are sold at a discount, versus the prices of regular cartridges, in exchange for the customer's agreement to use the cartridge only once and return it only to Lexmark for remanufacturing or recycling.